Extreme Visa Credit Card with a low rate & rewards! Get a low rate Visa® credit card! Having a Scott Credit Union Credit Card means you can make the purchases you need without the added expense of a high interest rate or an annual fee. No matter where you are in your financial journey, Scott Credit Union has the perfect card for you. With low interest rates, no annual fee, low balance transfer fee, and the ability to earn rewards you really can’t go wrong with a credit card from Scott Credit Union! Apply online. With Scott Credit Union’s Extreme Visa Credit Card, you can save money with our low interest rates and reward yourself along the way! Enjoy 1.99% APR for 12 billing cycles on purchases. Plus, get 0.00% APR for the first 12 months on balance transfers with a low balance transfer fee of 2% of the balance transferred or $10, whichever is greater. After 12 months, the rate changes to as low as 8.90% APR to 15.90% APR depending on your credit. Plus, you will earn rewards when you make purchases with your card. No matter how big or small the purchase, you can rest assured that you are getting the best deal with an Extreme Visa Credit Card from Scott Credit Union. You can apply quickly and securely with our online application in as little as 10 to 20 minutes. You can also apply in person by visiting any of Scott Credit Union’s convenient locations, or over the phone by calling our Member Service Center at 618-345-1000, Option 3. With Scott Credit Union’s Extreme Visa Credit Card, you really can have it all. Not only will you enjoy a low rate, you will earn rewards too! For every $1 in credit card purchases, you will earn one point. Points are redeemable for merchandise, travel, gift cards, charitable donations, and cash back! Plus, browse rewards and redeem points online with our ScoreCard Rewards! Website that is available through your credit card information on SCU Online Banking. With SCU Online Banking, you get secure online access to your account so that you can review card activity, view billing statements, and make a payment! Get started by registering for SCU Online Banking. 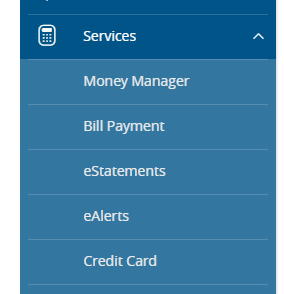 Once you log into SCU Online Banking, click on credit card in the services tab in the main navigation. You will be automatically logged into your credit card information. Learn more about SCU Online Banking. 1Please review account agreement for benefit details and conditions. 2APR = Annual Percentage Rate. Promotional rates for the first 12 billing cycles, after the 12th billing cycle the rate changes to as low as 8.90% APR to 15.90% APR depending on creditworthiness. Getting approved for a credit card can be difficult when you don’t already have an established credit history. We’ll help you get started on the path to a great score with the credit builder program on our Extreme Visa credit card! You can apply quickly and securely with our online application in as little as 10 to 20 minutes. You can also apply in person by visiting any of Scott Credit Union’s 15 convenient locations, or over the phone by calling our Member Service Center at 618-345-1000, Option 3. 1To become a member, a $5 minimum deposit is required to open a savings account. 2Please review account agreement for benefit details and conditions. 3APR = Annual Percentage Rate. Promotional rate for the first 12 billing cycles, after the 12th billing cycle the rate changes to as low as 8.90% APR to 15.90% APR depending on creditworthiness. At Scott Credit Union we want to provide you with the best value possible. That’s why we offer ScoreCard Rewards on our Extreme Visa Credit Card. Earn on everyday transactions – With ScoreCard Rewards, points add up fast when you use your card for your everyday purchases like groceries, gifts, fuel, dining, and more! Broad Offering of Awards – choose from thousands of name-brand electronics, recreational merchandise, jewelry, home goods, appliances, workshop tools, travel options, games, and toys. And we are always adding something new! Travel – get travel accommodations such as hotel stays at top properties, airfare, car rentals, cruises, etc. Anywhere you want to go, you can use your points to get there. Statement Credit – you can reward yourself by choosing to credit your SCU Extreme Visa account, (this credit will be applied to your statement within 3 days). Cash Back (ACH) – whether it’s to pay a bill, buy a dinner out, or to purchase a gift for someone special, an ACH electronic deposit is a perfect choice for your reward redemption. (The ACH reward is sent to a checking/savings account of your choice within 5-7 days). Gift Cards – you can use your points for gift cards too, including iTunes, Amazon, or for movie tickets and much more! Already have an Extreme Visa Credit Card and want to browse your ScoreCard Rewards account? Login into SCU Online Banking, click on the “Services” tab in the main navigation and select credit card. You will then have to click on the card for which you want to view your Rewards. This will launch access to your credit card account in another window. Click on the green “View Rewards” button1. This will launch the ScoreCard Rewards website via a single sign-on login. If you are not already registered for an SCU Online Banking account please do so by clicking the “Register” link just below “SCU Online” on the top right hand side of this page. 1If you have not previously received any rewards points the “View Rewards” button will not show. To get a preview of the rewards please visit ScoreCardRewards.com. Have you had a few bumps in the road when it comes to your credit? This card can help you get back on track without breaking the bank. Here’s how it works: Become an SCU member, and once you’re approved for a secured credit card, you’ll put down a 120% security deposit to cover your line of credit. For example, a $600 deposit sets your credit line at $500. With Scott Credit Union’s Secured Visa Credit Card, you really can have it all. Not only will you enjoy a low rate, you will earn rewards too! For every $1 in credit card purchases, you will earn one point. Points are redeemable for merchandise, travel, gift cards, charitable donations, and cash back! Plus, browse rewards and redeem points online with our ScoreCard Rewards! Website that is available through your credit card information on SCU Online Banking. 2APR = Annual Percentage Rate. Promotional rate for the first six billing cycles, after the sixth billing cycle the rate changes to 15.90% APR depending on credit worthiness. To make your credit card payment, you will need to have access to your accounts via our SCU Online Banking. Please register now by clicking on register below “SCU Online” in the top right-hand corner of this page. If you are already registered for SCU Online Banking, simply log into your account. Transfer the money for your payment from one of your deposit accounts with SCU to your credit card. To complete this transfer, click on the orange “Transfer Money Now” button in the top right corner of your main accounts listing screen. First, select the account from which you want to transfer your payment. Then, select your credit card account in the drop down to transfer to. Enter the transfer amount. Complete the transfer by clicking the "Transfer Funds" button. This button will be grayed out until you have completed all the previous fields. Login into SCU Online Banking, click on the “Services” tab in the main navigation and select credit card. You will then have to click on the card to which you are making your payment. This will launch access to your credit card account in another window. Click on the green “Pay Bill” button. Then you can set up a payment account. Your payment account can be an account at SCU or at another financial institution. 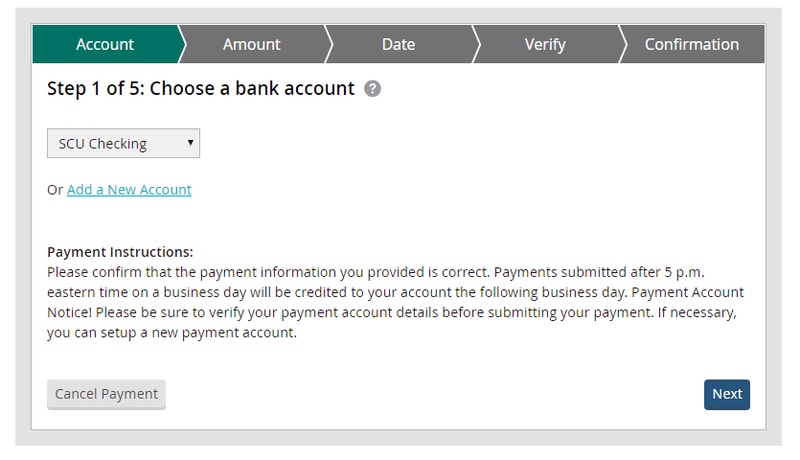 Once your payment account is set up, you can make the payment from that account to your credit card.